A city may be read through its geography, its infrastructure and social structures, its propensity for happiness (or gloom), the quality of its food or manufactures, the attractions it offers tourists, the stories of the lives of its inhabitants, its number of days of sunshine, its ability to make trains run on time, the record of its triumphs and catastrophes… many things. It can also be read in less direct ways; avoiding the indexes through which cities are typically assessed. city you can learn like a musical instrument. When we travel to other places, more often than not we spend much of our time in cities. It’s not only the speed and energy of the world’s great cities that attracts us but also their ability to slow us down, to intensify perception, and allow us to have a sense of the gift of things we may otherwise overlook or undervalue. 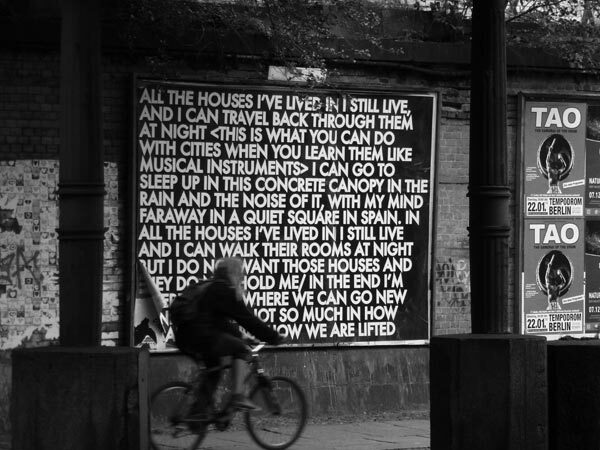 Echoes of Voices in the High Towers, Robert Montgomery at the former Tempelhof Airport, Stattbad Wedding and 20 billboards across Berlin. July–October 2012. Presented by Neue Berliner Räume.